Our one or two bedroom bright and modern condos for rent are spacious, comfortable, and affordable. All units are air-conditioned and have 2 bathrooms, in-unit washer/dryer, and full kitchens. 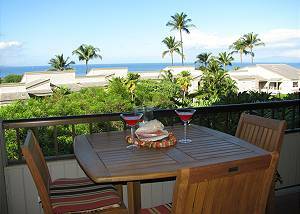 From your own private lanai, you can enjoy views of lush tropical landscaping with flowering vibrant flowers, the shimmering Pacific Ocean, as well as the unique crescent-shaped volcanic crater named, Molokini. Imagine yourself relaxing while watching the sun come down softly from the comfort and quiet of your lanai closing out another day on your vacation of a lifetime. An on site concierge is available 7 days a week to help book any tours or activities you wish to do while on your Hawaiian getaway. For those travelers who want to paddleboard, snorkel, or maybe even treat yourself to an ancient Hawaiian outrigger canoe tour, all of those activities and more are located with vendors along the Wailea Coastal Trail which is just a mere 10-minute stroll from your beautiful vacation rental doorstep. The dazzling white sand beaches of Wailea, Ulua and Mokapu are also super accessible as it is only a 10-minute walk. For those who want to stay closer to the resort and relax, the amenities are plentiful! The two stunning pools on property are sure to entertain as well as a large outdoor area with barbecues and picnic tables where you can watch your kids playing in the pool while you get started on dinner for a barbecue night the family won't forget. From our grounds, you also have eye-catching panoramic views of the golf course and greens sloping toward the ocean. 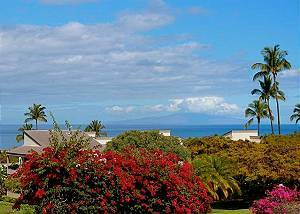 If you are a golfer or a tennis enthusiast, look no further than Wailea Ekolu Village for your accommodations, as the complex is nestled within the world-class Wailea Golf complex, also the Wailea Tennis Center is across the street. The Wailea area has several of the best options for the fine dining on Maui sure to please all in your party. The Wailea Gateway and the Shops at Wailea are both within walking distance with restaurants like famed hangout Monkeypod and Hawaiian vacation staple Tommy Bahamas which are both sure to impress and satisfy your taste buds to keep you coming back for more. So come and let yourself get lost in paradise and make Maui memories that will last forever. Meet your new favorite Hawaiian holiday getaway, the Wailea Ekolu Village.